Braking Explained - Motorcycle Safety Institute of S.A.
Braking is one of the most important things you’ll learn to do on a motorcycle; though newbies tend to get stuck on techniques like shifting and counter-steering, the most effective way to avoid an accident is through proper use of the brakes. Should I use the front, rear brake… or both? Balance is crucial to a motorcycle’s dynamics, and that’s why most bikes have individual front and rear brake controls. Most experts agree that roughly 80% of braking effort should go to the front wheel (which uses the hand lever on the right grip), and 20% to the rear (which is operated by the right foot pedal.) Front brakes require more effort because weight transfer from slowing down will shift the bike’s balance from the rear wheel to the front, enabling the front tyre to handle more load. When there’s less down-force on the rear tyre, it becomes much easier to lockup and slide that wheel, resulting in a loss of control… the front, however, is less likely to slip because of the weight transferred to that end. Braking by bike type: The 80/20 braking ratio can shift slightly based on the type of bike you’re riding; cruisers and choppers can handle more rear braking because they carry more weight over their rear wheel (due to the rearward position of the rider), while sport bikes can tolerate higher front braking effort since their forks are more vertical (take) and their wheelbases are shorter. Dirt bikes rarely see front brake usage due to the nature of loose terrain. In the hands of experienced riders motard or supermoto bikes can even be slowed down by sliding out the rear tyre; an effect they just love to show off when they get the chance. The lean angle issue: Tyres are most effective when they’re upright, so you’ll need to keep that in mind when you start to lean your bike over. Let’s say that 100% of a tyre’s available grip is available when it’s at a 90-degree angle; once that angle starts decreasing, its ability to maintain grip will also drop. Though grabbing the front brake might not break the tyre free when it’s upright, the same effort could cause a skid when the tyre is leaned over, and that loss of traction can instantly lead you to “tuck” the tyre under and triggering a wipeout. Some braking effort can be applied while a motorcycle is turning, but the bike will be far less tolerant of brake input when increased lean angles are involved. Be super aware when you squeeze the brakes while you’re turning, and try to get most, if not all, of your braking before you commit to the turn. How many fingers? The simple answer I give my students, or anyone for that matter is: 4 fingers if you like flying more than riding, 3 for sissies, 2 for the experienced and 1 for the pro. Using 2 fingers, never grab or try and simulate ABS by pumping the brakes, just squeeze firmly and keep on squeezing the brake lever until the bike comes to a stop. The more urgent the situation, the more firmly or swiftly you have to squeeze. Keep your head and eyes up and push back from the handlebar to keep your body from slamming forward applying the 80/20 braking rule. Be aware of road conditions: Different surface conditions require different braking techniques, and you’ll want to use your front brakes with respect when traction is iffy. Locking up the front can easily cause you to lose control of your bike, while locking up the rear is much more likely to be inconsequential. The possibility of sliding either end of your bike will be greatly dependent on the traction conditions beneath your tyres. Enter areas where oil spills are likely with caution; these high-risk areas include intersections, tollbooths and parking lots. Drag your rear brake where you suspect slick surfaces, and you’ll have a backup plan in case you start to feel the front tyre slide. It takes quick reflexes, so stay on your guard and remember that it’s much easier to recover from a rear wheel lockup than from a front slide. Those rules get taken to another level when it comes to riding off-road, as dirt bike riding almost never involves the front brakes. If you plan on hitting trails, make it a habit to keep your hand off the front brake lever, or else you might have to get used to tasting dirt more often than you need to. How about linked brakes? Many scooters, touring bikes, cruisers, and even sport bikes are equipped with linked brakes, which are designed to actuate both front and rear brakes through a single lever. Some systems are only rear-to-front linked, while others work both ways, but the goal is the same for both: remove some of the guesswork involved with choosing between front and rear brakes. While a majority of riders can’t produce stopping distances as short as those created by linked braking systems, this feature isn’t always popular among some performance enthusiasts. What about ABS? ABS, short for anti-lock braking systems, is designed to detect tyre slip and “pulse” the brakes so they don’t skid. The system allows the rider to apply full effort at the hand or brake levers without worrying about locking up the tyres, but ABS isn’t effective when a bike is leaned over. Though it’s difficult to match the stopping distance of an ABS-equipped bike in wet or compromised traction situations, not all riders are enthusiastic about computerized brake intervention. There are talks on considering making ABS mandatory on motorcycles, but both sides of the debate can be suppressed when manufacturers equip ABS bikes with a switch that can turn the system on and off. How hard can I brake? Learning the finer points of your bike’s braking performance is the key to keeping your bike in control, so it’s a good idea to explore those limits in a safe environment. Practice repeated stops in an abandoned parking lot or closed area, and you’ll start to get a feel for the amount of effort that triggers tyre slip. Try stopping with your front only, your rear only, and then a combination of both: that way, you’ll get a sense of how hard you can apply the brakes in a panic stopping situation. Once you become more familiar with your bike’s brakes, the sensations of weight transfer will start to feel more apparent. Stopping hard enough on the fronts might even lift the rear wheel up, and using the rear brakes hard enough will result in a skid. You’ll also find that you can get away with applying more pressure at higher speeds. Learn those limits, and you’ll be much better prepared for the unexpected. Better still; get taught these limits under the expert eye and advice of a motorcycle instructor. 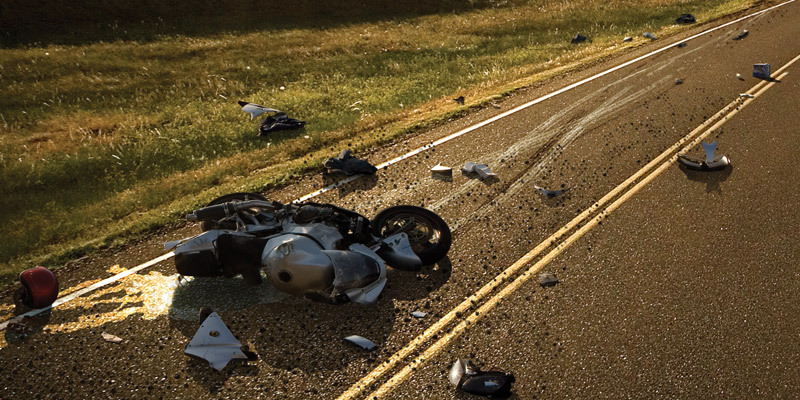 This article will provide guidelines on how to approach a motorcycle road crash wherever you are in the world. Enter your email address and receive notifications by email as and when we publish it on our website. All contributions will be gratefully acknowledged and are tax deductible. Thank you!